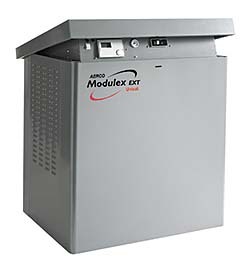 The Modulex EXT series is designed for hydronic heating systems. Each 160,500 Btus per hour thermal module operates independently to increase turndown, and the simultaneous low-fire operation helps maximize operating efficiency. The design establishes built-in redundancy for uptime reliability. If one module fails, the remaining burners continue to fire, and the unit remains operational. Installation of the unit has been simplified as multiple supply and return piping, gas piping, and venting locations allow units to be installed in most configurations. The unit is rated for -20-105 degrees ambient temperature, allowing the unit to be installed outdoors with no modifications.